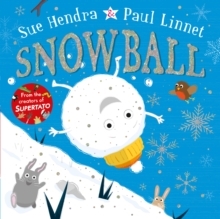 Created by award-winning, bestselling duo Sue Hendra and Paul Linnet, Snowball is a brilliantly funny picture book, with wonderfully comical images illustrating the hilarious rhyming story - perfect for Christmas!A lonely young snowball, stuck at the top of a mountain, decides to visit the local town for a bit of fun - but on his way he trips, falls, and starts to roll . . . and when a snowball rolls through snow, we all know what happens! This snowball picks up not only snow, but a myriad of other odd things on his way down - a sheep, a line of washing, a bicycling bear, ending up in the Zoo.